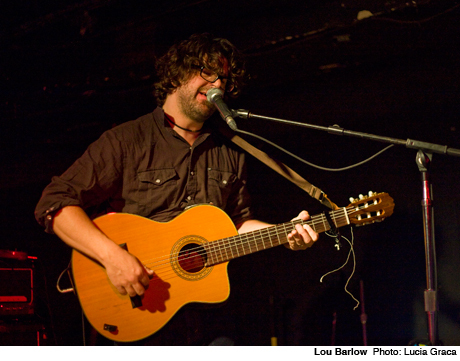 For his current backing band, lo-fi hall of famer Lou Barlow wisely raided Mike Watt's tour bus, enlisting the Missingmen, aka Tom Watson and Raul Morales, on guitar and drums, respectively. While the two spent parts of the show, um, absent, their prolonged guest-starring stint proved the highlight of the inherently uneven affair. Book-ending the gig with a pair of solo, acoustic mini-sets, Barlow mined his various back catalogues, playing intimate takes on Sebadoh classics like "Magnet's Coil" and solo standouts like "Legendary." At turns, Barlow's troubadour shtick channelled Mountain Goats' John Darnielle — with a better voice — and Gordon Lightfoot — without the muscles. Though scruffily admirable, the first set struggled against scattered bar noise and Dinosaur Jr.-related conversations. And then the Missingmen turned up. From the outset of their tenure, Watson and Morales went big, with shredded guitars and mammoth percussion; throughout, Barlow's deceptively smooth vocals stood out above the clamour. Initially jarring but ultimately rousing, the trio ran through a slate of energizing tracks. A towering rendition of "Home" and an agro-rock rendering of "Faith Defies the Night" soared while a Tool-evoking "Gravitate" ramped up magnetically. After sips of whiskey and spats of Seinfeld-ian banter, Watson and Morales took their leave, returning Barlow to singer-songwriter land. Following the intensity of the middle set, the acoustic reprise seemed particularly slight. Barlow's charisma kept things buoyant, but the sudden change spotlighted unevenness, despite the symmetry.